A range of Data Loggers for monitoring Meteorlogical Conditions. This could be from simple recording of Temperature and Humidity to Rain Gauge Data Loggers to full blown Weather stations for monitoring climate and growing conditions etc. 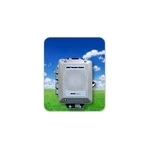 Micropower GSM Data Logger for Environmental and Weather Station Applications. Enclosure & 35Ah Battery. The HOBO Micro Station is designed for monitoring micro-climates for crop or alternative energy installations. The Micro Station has four sensor inputs which accept any combination of the available plug-in Smart Sensors.